Fujifilm has announced the impending release of the FinePix XP140, its latest rugged point-and-shoot that adds new automated features and improved durability against the elements. The compact camera is waterproof to 25m / 82ft, shockproof up to 1.75m / 5.9ft, freeze-proof to 10°C / 14ºF and dustproof. Compared to its predecessor, the XP130, this is an improved waterproof depth of 5m / 17ft, with all of the other stats staying more or less the same. The XP140 also includes a more pronounced grip for better handling in rough environments. At the heart of the XP140 is the 16.4 megapixel 1/2.3-inch backside illuminated (BSI) CMOS sensor with a maximum sensitivity of ISO 12800, a stop higher than the XP130. In front of the sensor is an optically stabilized Fujinon 5x optical zoom lens that starts at 28mm (35mm equivalent). With Fujifilm's Digital Zoom technology, the camera reaches 10x zoom. An example of a scene using Fujifilm's Eye Detection mode. New to the XP140 is Fujifilm's evolved Scene Recognition Auto mode, which 'can detect a main subject within a scene and automatically optimize the camera setting[s].' Also included is an 'Eye Detection' feature that focuses on subjects' eyes and other auto-intelligent modes including a timer mode that automatically triggers the shutter when the camera detects a smile. Fujifilm has also included 17 of its 'Advanced Filters' including its Rich & Fine and Monochrome (NIR) presets. On the connectivity front, Fujifilm has included Bluetooth for easy connection to smartphones via its Fujifilm Camera Remote app and Instax printers. 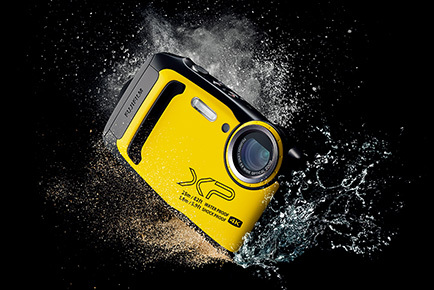 The FinePix XP140 will be available at authorized Fujifilm retailers in yellow, blue in the United States and yellow, blue, lime, white and dark silver in Canada. It's expected to be released in March 2018 for $229.95 USD / $239.99 CAD. Valhalla, New York, February 14, 2019 – FUJIFILM North America Corporation today announced the launch of the FUJIFILM FinePix XP140 (XP140), the latest rugged camera in the XP series. The newest addition includes upgrades to the construction of former models in the XP series, making it waterproof to 82 feet, shockproof from up to 5.9ft1, freeze-proof to 14°F and dustproof-- the ideal accessory to capture any adventure. Four Rugged Features: Waterproof, Shockproof, Freeze-proof and Dustproof The XP140 complies with waterproof and dustproof protection standards of products, stipulated by IEC (International Electrotechnical Commission). The XP140 is waterproof to 82 feet, which is 25% improvement from its predecessor XP model. With its stylish design enhanced, the XP140 is easy-to-use during outdoor activities with features including a grip and a double-locking mechanism for the battery compartment. With the XP140, users are able to enjoy capturing their adventures without worrying about water, sand or dropping the camera -- making it the perfect camera for users looking for their first, serious camera experience as well. High-Performance Sensor and Lens for Premium Image Quality Equipped with a CMOS sensor and FUJINON’s 5x optical zoom lens with the zoom range starting from 28mm (35 format equivalent) on the wide-angle side, the XP140’s optical zoom range will reach up to 10x with Fujifilm’s Intelligent Digital Zoom technology. The camera also has an optical image stabilization mechanism and output sensitivity as high as ISO12800 (one stop higher than the XP130 model) to produce sharp images free of noise even in low light conditions. Fujifilm’s years of experience are reflected within its color reproduction technology, which ensures beautiful colors in any condition. Versatile Automatic Shooting Functions to Support Your Photography Experience With evolved ‘Scene Recognition Auto’ mode, the XP140 can detect a main subject within a scene and automatically optimize the camera setting. 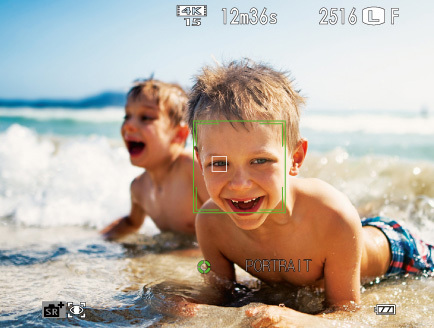 The ‘Eye Detection’ feature helps to capture portraits easily by automatically focusing on the eyes of the subject. A variety of other auto-intelligent features such as the self-timer mode – which automatically releases the shutter when detecting a smiling face-- helps capture instant moments. The camera also features 17 variations of ‘Advanced Filters’ including the new “Rich & Fine” and “Monochrome (NIR)”. These selections are fully assisted with an implemented unique live-view interface. Bluetooth® Pairing and Wireless Connectivity for Automatic Photo Transfer and INSTAX® Printing Bluetooth® compatibility allows automatic and instant image transfer to smartphones and tablet devices by easy paring registration. The technology also syncs the time and location information from your device and attaches it to images, as well as enables remote shooting function via application. To utilize this feature, users can download the free “FUJIFILM Camera Remote” app to their smartphone or tablet device and easily transfer photos and videos in the camera to the device and download directly. For INSTAX SHARE SP printer users, images can be transferred from the camera directly to the INSTAX SHARE SP printer for quick printout. 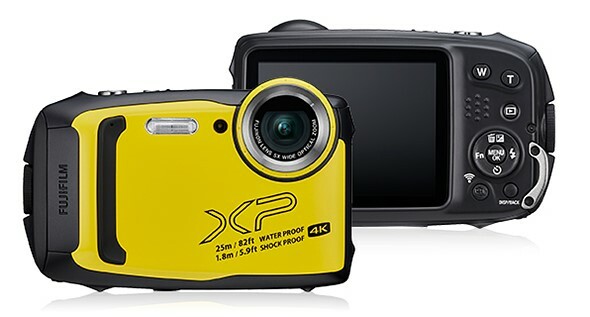 Availability and Pricing The FinePix XP140 will available in yellow or sky-blue in the U.S and available in sky blue, lime, yellow, white and dark silver in Canada. It is anticipated to be released in March 2019 for USD $229.95 and CAD $239.99.